On our first full day in Boston we checked off another destination on my Bucket List! This Bucket List is full of weird places I HAVE to see….. We did Alcatraz last year, The Ohio State Reformatory a few years back and Salem, MA is on this list. I love history, I LOVE haunted History and I feel this need to be in the places. I also love Historical Fiction set in Salem so the fact that we get to actually go there was incredible! One of the BEST parts was the journey there…. We took the Salem Ferry, a 55 minute cruise from Boston to Salem and it was lovely. Seeing Boston from the Harbor, the coast line to Salem filled with incredible homes and being out on the water was great…. well after 2 Dramamines! haha! I always thought I might be a East Coast girl and I think I could be the smaller towns built on a harbor, full of sail boats and beautiful homes on the water… I could get use to that. It is all so Americana! If you choose to go from Boston to Salem then you must do the Ferry and the website is HERE!!! Salem itself is a small historic town full of these old rich buildings but also oddly set right next to say a Walgreens. It’s this weird mix of old and new, but I tried to imagine what it was like in the 1600s and take in what all has happened here while we walked around town. Here is the thing with Salem….. a town full of history has NO history. This my friends, the Salem Witch Museum has NO artifacts, no relics…. Just all recreations and actors. Think about it…. where did everything go? Where are the pews from the courthouse that sentenced these women to death? Where are the Bibles they prayed with, the clothing from the day? I really wanted to see and be among REAL things. And there is nothing real in Salem except the buildings. This was neat a very Salem-esk art installation by the Witch museum, I made a reluctant Matt pose for me! The main street is lined with Witch shops and I wanted to get my Tarot Cards read but Matt wouldn’t let me… I regret that, that would of been neat. The best part of Salem is the old cemetery literally on a block next to a CVS, so weird. 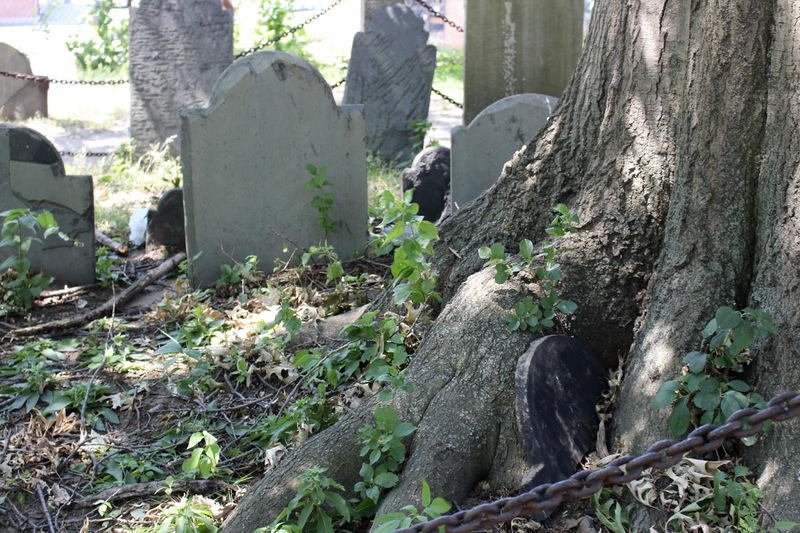 But walking amongst these headstones some go back to the early 1600s, that was cool….. that made the day. I mean think about it, how much they have seen…. who has been there?! There was also the Witch Memorial and each person hung or stoned to death got a stone set around this garden, I tried to take my time to walk around and really take it all in. We read about these people, watch movies based on them, read the books…. but this is real, it really happened and thats hard to wrap your head around. Now… this was the next best thing… The Witch House, an ORIGINAL house from the 1600s in the cemetery BUT sadly you couldn’t go inside. I mean WHHHHHyyyyyyy??????????? Salem also has a history of Maritime and naval history that also make this little town special. Matt and I went to this famous little place called the Clam Shack for lunch that is on the water and that was fun, we ate our weight in fried clams! Here is the thing……. I am SO glad I can say I have been there, I was actually there where this all happened. I check another place off my bucket list BUT honestly it was so very disappointing. Where did all the real history go? Thats what I would like to see. That tree/art thing that Matt stood by is pretty awesome. I can't imagine the blending of 1600 buildings with CVS's but, definitely a sign of the times!I love historical stuff too. My Dad was born and raised in Gettysburg. I still have family up there. I remember being SO bored with the museums and civil war tours etc of the actually battle areas when we went up twice to visit as a teenager. It is on my bucket list to go back, truly savor and realize all that happened there. I remember seeing the room from the square where Lincoln wrote "the Gettysburg address" at least (from the street, you could not go in the building).1600's is a long time ago, and if the town has not not had anyone wanting to keep up with artifacts and stuff all these years, it is a sad reality. Thanks for the pictures though!